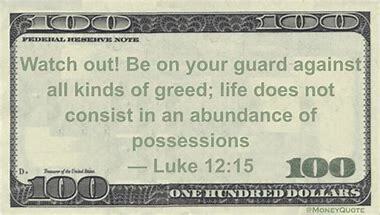 Dear Lord, I always thought greed was found in those who indiscriminately accumulate. But it’s also found in me when I complain for what I did not get. I am embarrassed over the many hours I’ve spent thinking about personal economics and whether I should be concerned, upset, or pleased with this or that financial situation in my family, work, or country. Your words, "Life does not consist an abundance of possessions" are heart searching. Oh, how the "good life" could rob me of "real life." Soon, I must walk away from all of it. You have created me for eternity. Forgive me for trying to live for this short earthly life. I beg you to free me from all the pains and thrills I let overtake me regarding the heap that is soon to be distributed to others. Whoever has the most toys when they die will probably lose.